Escape from a world without colour. Will you risk it and dash for the exit, or will you find a more creative approach? "You find yourself trapped in a cell, details include a concrete floor, rusty bars and shambled brick walls, and two guards patrolling the perimeter. You, the player, must obviously escape. But how? Well, there doesn't seem to be any way out, you've hugged every wall to try and find an exit but to no avail, so now what? 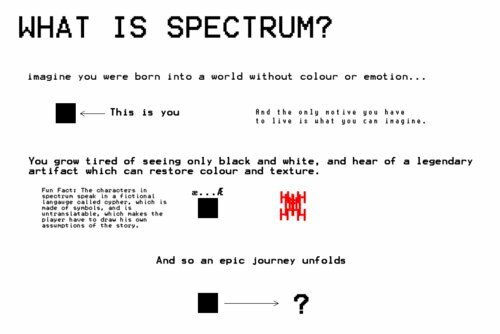 "Spectrum is a game about the lack of colours; you start as a black square, in a black town, on a white field. But soon they become bored of this standard life and set on a journey to find 'the integer', the magic relic said to restore the worlds many colours to the holder. But little does our protagonist know, that they might see things they may never want to see again. Featuring multiple worlds and unique challenges, this game aims to be a narrative experience over one focused on gameplay. 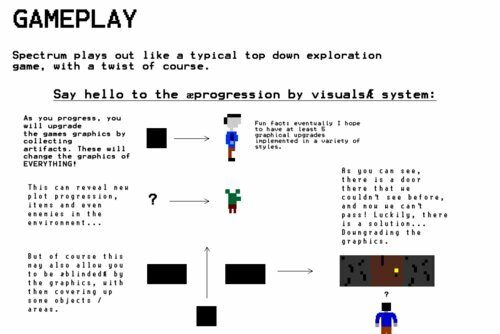 "The game has many states of graphics, and is in fact the main focus of the game. You will start as the most basic of shapes, a square, with the most basic of shades, black and white." "The game has simple keyboard/controller controls, arrow keys to move, 'a' to attack, 's' to inspect and 'd' to open up your inventory. The enter key will also be used to sacrifice health to decrease graphics at some points in the game and magic could be unlocked and used with the 'q' key."